In a long awaited return to the ancient city of Pompeii, David Gilmour will perform two shows this summer. The July performances will take place in the same amphitheater featured in Pink Floyd’s classic “Live at Pompeii” concert film. 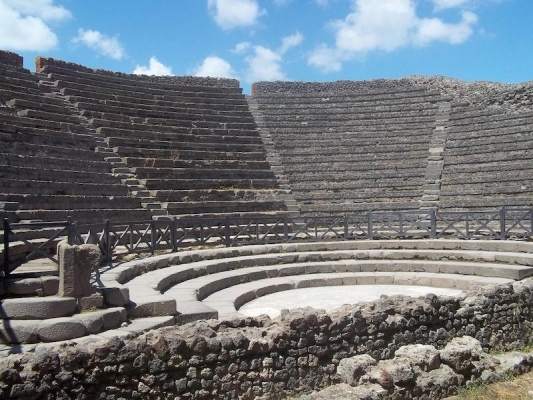 The site of the historic shows is in fact home to the oldest surviving Roman amphitheater, preserved by the infamous eruption of Vesuvius in 79 AD. The ampitheater resided under ash for nearly 1,600 years following the eruption of Vesuvius. Last month, on March 16, Italy's culture minister Dario Franceschini announced via Twitter, "Agreement reached. After 45 years, David Gilmour will play again at Pompeii on 7 and 8 July." Some devout Pink Floyd fans may be familiar with the venue, which was the filming location for Adrian Maben's 1972 concert film. While the 70s film was shot with no audience, this summer’s shows will be played in front of 2,000 lucky fans. Tickets for the July 7 and 8 shows went on sale in late March and nearly sold out (check www.DavidGilmour.com for ticket sales). In an effort to prevent scalping of the coveted tickets, strict ticketing restrictions were put into place. Tickets are limited to a maximum of two per person, and may only be purchased for one show (not both). Each purchaser will receive with his or her name on it, which must present to the box office along with photo ID and the credit card used to purchase. Only then will the ticket holder will be presented with a ticket and a wristband, which both must be shown in order to enter the site. With a price tag several hundred Euro plus a 15% booking fee (not to mention travel costs), these seats are not for fair-hearted fans. In a statement to the press, Gilmour said, "I want to thank the Ministry of Culture for giving me the opportunity to once again play this beautiful and historic venue. Performing there in 1971 was very special and I’m looking forward to returning and hopefully creating some more memorable moments made even more special by playing to an audience." Gilmour began his brief U.S. tour on March 24th, with a pair of shows at Los Angeles' Hollywood Bowl. He is scheduled to play at two venues in Chicago (Auditorium Theatre, United Center) and two in New York (Radio City Music Hall, Madison Square Garden). As part of Gilmour’s 2016 European tour, prior to the Pompeii shows, Gilmour will play in another 1st century amphitheater in Verona, Italy. Now that’s what we call (historic) rock and roll!